The Chicago Transit Authority’s above-ground ‘L’ station at State/Lake, which serves the Green, Pink, Orange, and Brown Lines, is scheduled to be completely reconstructed. The new station will be get elevators that will make it wheelchair accessible and create an accessible transfer to the Lake Street Red Line subway station, located directly below the elevated stop. The original State/Lake station was built in 1895. The Chicago Metropolitan Agency for Planning announced earlier this week that it is awarding $56.9 million of the region’s $225.7 million allotment of federal Congestion Mitigation and Air Quality funds to the project. A press release issued by the city of Chicago today noted that the station was the second busiest station on the elevated Loop tracks last year. The Chicago Department of Transportation is in charge of the project, as it has been for the recently constructed Cermak (Green Line), Morgan (Green/Pink), and and Washington/Wabash elevated stations. Like Washington/Wabash, the new State/Lake station will have wider platform than the facility it’s replacing. State/Lake is notable for having very narrow stretches of platform near the station house. This is not the first time that the CTA or CDOT set a goal of redesigning or rebuilding the station. According to Chicago “L”.org, in 1998 the CTA announced a plan to combine State/Lake, Madison/Wabash, and Randolph/Wabash. The latter two stations were combined into the new Washington/Wabash station which opened August 31 of this year. Later, CDOT expressed interest in building a new station next to the existing one, Chicago “L”.org says, which would have removed some obstruction of the views up and down State Street. The $56.9 million CMAQ grant won’t cover the full cost of construction. The press release says “The full cost of the new station will not be determined until the design process progresses, but it is expected that it will exceed the construction cost of the new station at Washington/Wabash of $75 million.” The city previously won a $5.5 million federal grant to bankroll the design of State/Lake. It’s a less than impressive station house at a prominent street corner, they should make it similar to Washington/Wabash, in terms of eye-catching architecture. 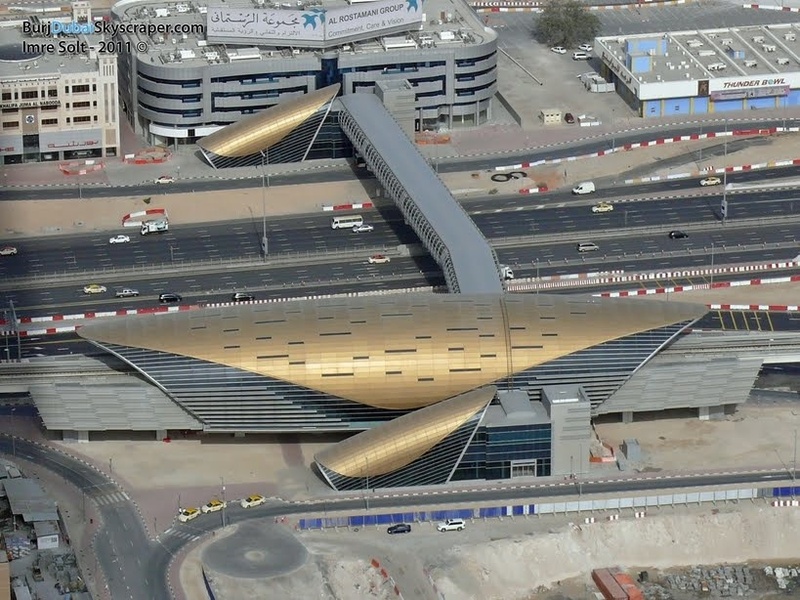 Hmm, what if the design of the new station was inspired by the dinosaur bone-like architecture of Santiago Calatrava? That would really be thinking outside the box! I never said that Washington/Wabash was original architecture, but it’s definitely a worthy entrance to Millennium Park. Ross Barney Architects has done quite well on the Cermak-McCormick Place and Morgan stations (As well as their rendering for the Belmont station on the Blue Line. ), so I think they’d be up to the job of world-class design. This is such a prominent location that it requires eye-catching architecture and the station house is a drag. Excellent. Chicago is making massive progress on ADA compliance. Pay attention, NYC! You are the laggard! Was going to recommend something along the lines Cermak(and the Burj Dubai), but completely translucent or something that can be lit in a variety of colors. CTA should really think carefully about a way to connect the new elevated station with the Red Line below. As a Pink Line rider, the lack of a direct connection to the Red Line is frustrating. Clark/Lake has a similar transfer within the adjacent buildings. Here, there may be room in State Street’s wide median to build a direct, enclosed escalator from the Inner Loop platform to the Red Line mezzanine below. Then a transfer bridge over the Loop tracks so Outer Loop riders can also access said escalator. Just wanted to point out that last picture was definitely not taken before Trump Tower was built… It shows a completed Block 37, which was completed after Trump Tower. State Street does not have a view of Trump Tower down it’s corridor. Wabash, however, does. The question I have is, will this design feature a direct, accessible connection between the paid areas of the elevated station and the Red Line subway station? Currently, the only elevator entrance to the Lake Red Line stop is between Randolph and Washington on Lake, on the west side of State. Barring the construction of an elevator(s) connecting the north entrance of Lake to State/Lake (or other step-free connection between these 2 stations featuring two elevators in close proximity), this would be no more an accessible connection than that what now exists between Lake and Washington/Wabash.